The latter feat was achieved by contracting several new zero-emission solar and wind farms to produce renewable electricity equivalent to Canberra's consumption. Canberra retail electricity prices continue to be among the lowest in Australia. If you don't live in Canberra, you need another way to neutralise your emissions. Fortunately, the cost of solar photovoltaic (PV) and wind power have both fallen rapidly. Australia has long been in the midst of a boom in rooftop PV, and many Gigawatts of ground-mounted PV and wind farms are being built around the country. This has put Australia on track to reach 50% renewable electricity in 2024. Each Megawatt hour (MWh) of electricity generated by renewables reduces electricity from coal by a similar amount, and therefore avoids about 0.9 tonnes of carbon dioxide emissions. 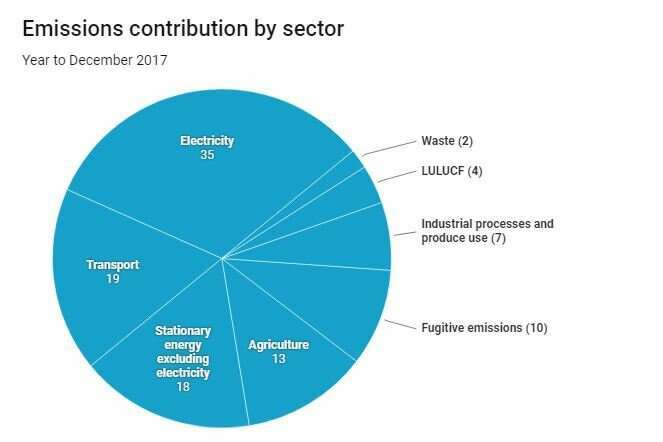 The above pie chart, based on federal government data, shows the various sources of Australian greenhouse emissions in 2017. Electricity production is the largest source and can be neutralised by substituting PV and wind for coal and gas. Emissions from electricity use in commerce and industry, the land sector, industrial processes and high temperature heat is largely beyond your control, however, so it's perhaps best to focus your attention closer to home. Now that we've looked at these various strategies, let's now consider a family home with three occupants and one car. A 10kW PV system on the roof can make a substantial reduction in their greenhouse footprint by offsetting 14 tonnes of CO2 per year. Switching to an electric car saves 3 tonnes per year and substituting electric heat pumps for gas saves a further 1- 5 tonnes per year.